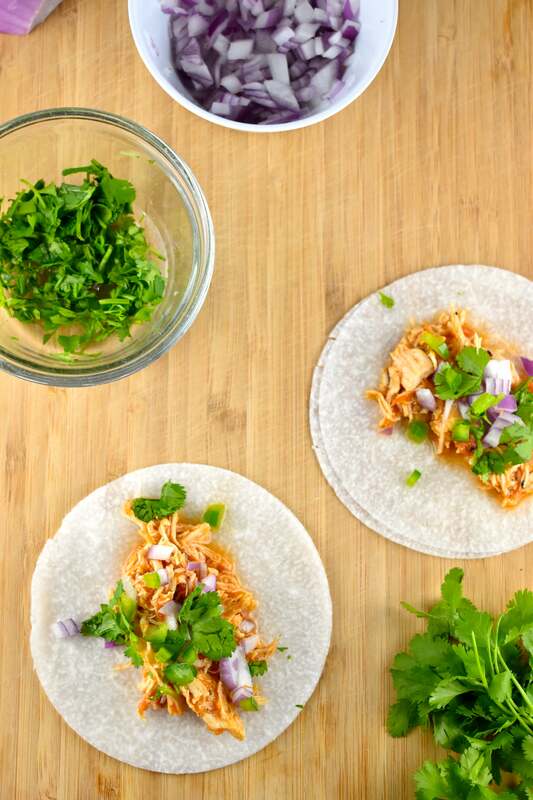 The best thing about them is that jicama tortillas are very nice and crispy, so they stayed together, no matter how many ingredients I stuffed in my taco, which was a huge plus. The flavor of the jicama is also very mild, so it allowed the insides of my taco to be the flavor stars. All of those flavors are amazing, of course, so I really enjoyed eating my tacos. 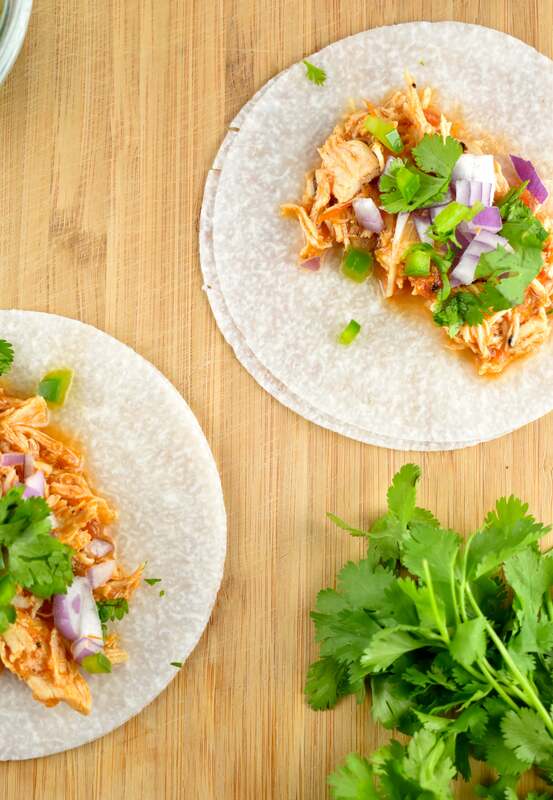 Now, it’s not quite the same as using a corn or flour tortilla, but overall, I think it’s a fantastic alternative whenever you want to save some Points. I ate some for lunch the other day, and was able to enjoy four DELICIOUS tacos, for 0 Points. I mean, really, that’s pretty amazing. 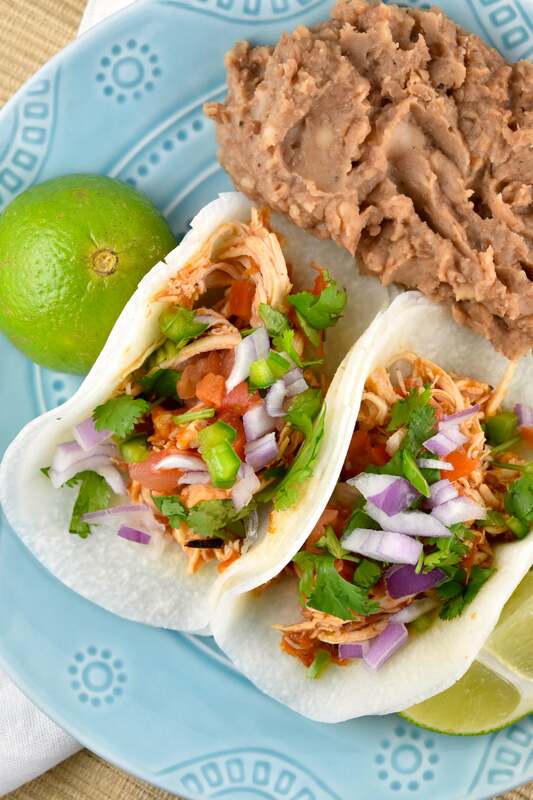 For these 0 Point Tacos, I used my Crock Pot Salsa Chicken Recipe for the main component. Then I just filled it up with lots of other delicious 0 Point toppings, and voila! When making the tacos, I found it easiest just to use the jicama tortillas at room temperature. Having them cold is a bit too much of a contrast to the warm insides of the taco. I did try warming them a bit, and I liked that, but it was hard to keep them warm for long. Maybe if you have a tortilla warmer this would help. Jicama is a round, brown-colored root vegetable native to Central and South America. It’s also referred to as a Mexican yam bean, or Mexican turnip. Inside, it’s flesh is white, and can be eaten raw or cooked. The texture is similar to that of a water chestnut. It’s crisp and juicy, but more savory than sweet. It’s very nutrient rich, and has many nutritional benefits. It’s definitely a veggie you wanna get on your plate, STAT. If you’ve never had jicama before, you may be feeling a bit intimidated right now. But hang in there! I’m here to help you out. While you can eat jicama raw, you first need to peel the plant before eating it. The outer skin is thick and fibrous, so use a good, sturdy vegetable peeler to remove it, until you get to the fleshy white insides. Then, the white part can be cut up and eaten raw or cooked. The great thing about jicama is that it retains it’s crisp texture, even when exposed to heat, or other wet ingredients. This makes it ideal for using as a taco shell because it doesn’t fall apart when you start filling it up with all those essential taco components! You can also slice up the insides into sticks, and serve it as a crudite. I also love it with a drizzle of fresh lime juice, and a sprinkle of chili powder for a refreshing summer snack. While raw jicama is my preferred way of eating it, jicama can also be roasted or sauteed, much like a turnip. They’ll soften when you cook them, but they’ll retain their moisture. 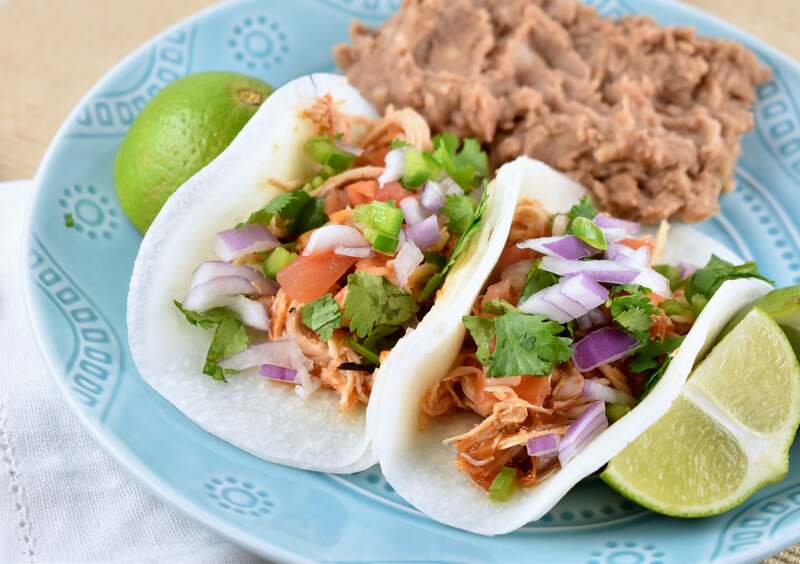 Ok, now that you’re an expert on jicama, let’s talk about how you’re going to dress up your tacos! 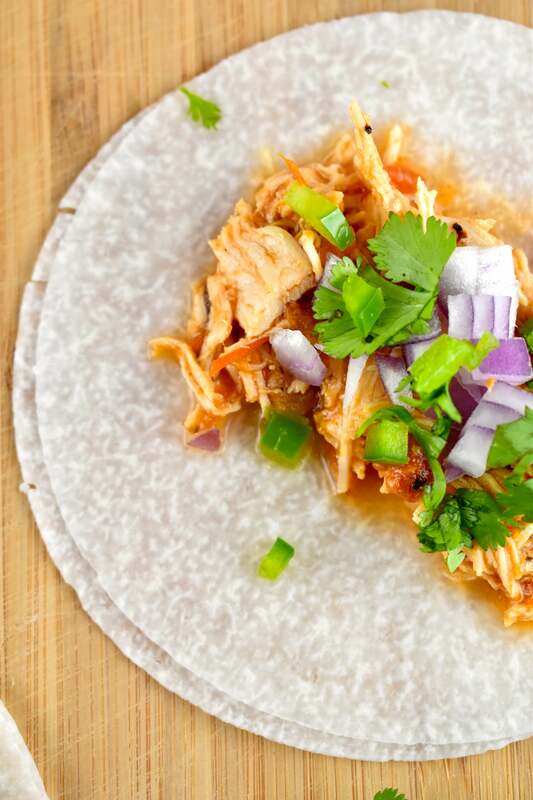 The list of taco fillings is endless, but here’s a list of taco toppings that won’t cost you any Points. Feel free to add on any other of your favorite toppings like cheese, guac, sour cream, chipotle crema, etc. Just make sure to count the Points for those! 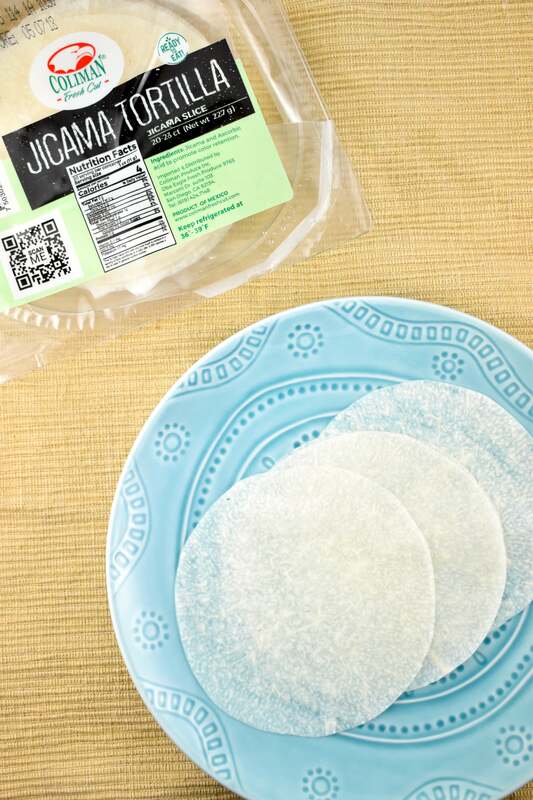 Jicama tortillas may not be the easiest thing to find, as they are a pretty new concept, but check your local health food store. I found mine at Whole Foods. *BONUS – they also have jicama tortilla chips now too!! 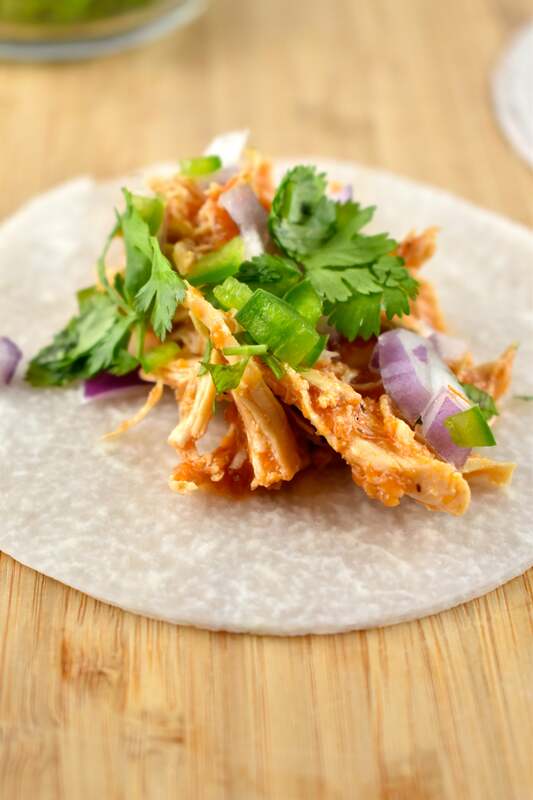 Fresh, crisp, low-carb jicama makes for a wonderful alternative to high-carb tortilla shells! An easy, low Points meal in minutes. Stack two of the jicama tortilla on top of each other. 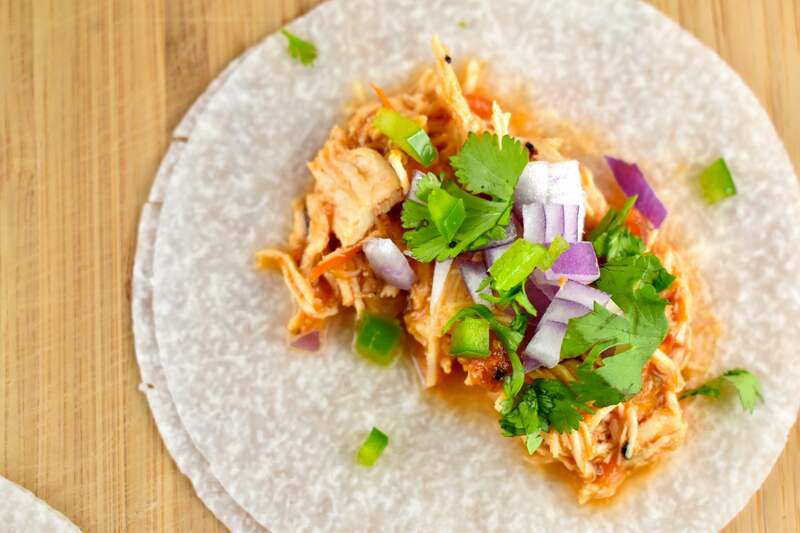 Top with a ¼ cup Crock Pot Salsa Chicken, and add on any additional toppings you’d like. Where can these be purchased? I’m in California. I’m in Orange County and purchased them at Whole Foods. I’d call your local Whole Foods and see if they carry them. You could also check Sprouts, Mother’s Market, Gelson’s or any other health food store.